Leeds United came within a whisker of becoming the first visiting team to win at Aston Villa this season when only a penalty awarded in slightly controversial circumstances denied them a fully deserved victory. Pontus Jansson put United ahead and also hit the crossbar while Hadi Sacko was later denied by the woodwork, but Garry Monk’s men had to settle for bringing home a point from a 1-1 draw. Villa maintained their unbeaten home record thanks to an 85th minute penalty put away by their best player, Jonathan Kodjia, after a handball by Liam Cooper jumping for a high ball in a crowded area was spotted by the linesman. Referee Roger East initially gave a goal kick until he was surrounded by Villa players and persuaded to have a word with his assistant, who was not as well placed. He then changed his mind and Kodjia took full advantage to score an equaliser the home side had rarely threatened. Leeds were slow out of the blocks, but improved towards half-time and totally dominated the second period without being quite able to put away their opponents. Villa had their best chance apart from the spot-kick in the opening minute when Kalvin Phillips’ sloppy back pass sent the ball straight to Kodjia, but Jansson did superbly well to get across and block the striker’s shot. Kodjia then saw a 25-yard shot well saved by Rob Green after another error by Phillips has seen the ball given away. James Chester came within a whisker of the opening goal on the half-hour when heading just wide after a corner had only been half-cleared. It took United 37 minutes for their first proper sight at goal when Hadi Sacko got in behind the home defence only to see his low cross turned away for a corner. A better low pull back by Sacko gave Kemar Roofe a chance in the box, but his shot was well blocked by Chester. As Leeds finished the half better Stuart Dallas saw an angled volley from distance fly wide. The good work towards the end of the first half continued into the second for United and they went ahead on 54 minutes as Jansson found himself unmarked in the box to meet Dallas’s corner and Villa keeper Mark Bunn could not keep the ball out of the net. Within two minutes more good attacking work won another corner and after it was not cleared Jansson found himself in space again in the box. He brought the ball down superbly and quickly volleyed only to see the ball crash against the crossbar. 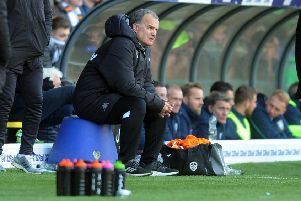 It was all Leeds now and Souleymane Doukara raced clear onto an astute pass by substitute Pablo Hernandez, but was flagged offside in a tight decision. Phillips dragged a shot wide when well placed on the edge of the box as the visitors’ more crisp and quicker attacking play was getting them chances. Villa briefly threatened as Kodjia rounded two players in the box and saw a shot beaten away by Green. Jordan Ayew also sent a volley wide from the edge of the box, but Leeds were soon back in attack as Hernandez cleverly made space in the area and sent a great chip agonisingly over. Hernandez then sent Sacko clean through, but the winger’s shot was saved by quickly advancing keeper Bunn. Liam Bridcutt, who had a tidy game in midfield, got forward to get a shot in from distance then went wide. However, Villa threw on more forwards in a bid to salvage something from the game, and were rewarded with the penalty, which was correctly given in the end but only after the referee had been hounded into changing his mind. This was the cue for a mad finish to the game and Leeds thought they had won it when Sacko was clean through again only to see his shot beat Bunn but hit the crossbar. Kodjia then ran through for Villa only for Green to make a great save. United came close again when Luke Ayling’s goalbound shot was blocked and the follow-up from Jansson was also kept out by a defender. Kodjia shot wide for the hosts, but after Rudy Gestede’s 25-yarder was easily saved it was all over with a point apiece and Leeds up to fourth place in the EFL Championship. Leeds: Green, Ayling, Jansson, Cooper, Berardi, Phillips, Bridcutt (Vieira 83), Sacko, Dallas (Hernandez 57), Roofe (Wood 69), Doukara.